After the September rains finally put an end to the fires and cleared out the smoky skies, I was anxious to get back outside after being trapped indoors by the smoke for so much of late summer. I had hoped to look for more meadows and open areas in the Rigdon area, southeast of Hills Creek Reservoir. I knew it would be hard to spot purple milkweed (Asclepias cordifolia) plants so late in the year, but I could at least assess the quality of the areas and the potential for milkweed or other interesting plants. With the flowers pretty much done for the season, it didn’t seem worth the many miles of gravel to get up to high elevations, so exploring more low-elevation meadows was the perfect goal. Ground rose (Rosa spithamea) is generally less than a foot tall. It is distinguished from our other roses by its chubby, gland-covered hips. There’s quite a bit of it at Mutton Meadow. On September 25th, Sheila Klest and I went to Monarch Meadow to see if there was any milkweed seed left and to collect any other seed of interest. The milkweed stems had mostly collapsed and there were very few intact seed capsules, but Sheila was able to bring home a bit of seed to try growing at her native plant nursery, Trillium Gardens. I was glad I had already gotten some for myself back in July (see Late Season Visit to Monarch Meadow) when they were just starting to ripen. Some sticky birdbeak (Cordylanthus tenuis) was still in bloom, and there was an unusually deep pink form of autumn willowherb (Epilobium brachycarpum) in flower in the meadow but little else. After we collected some seeds of grasses and purple and diamond clarkia (Clarkia purpurea and C. rhomboidea), we headed over to nearby Mutton Meadow. 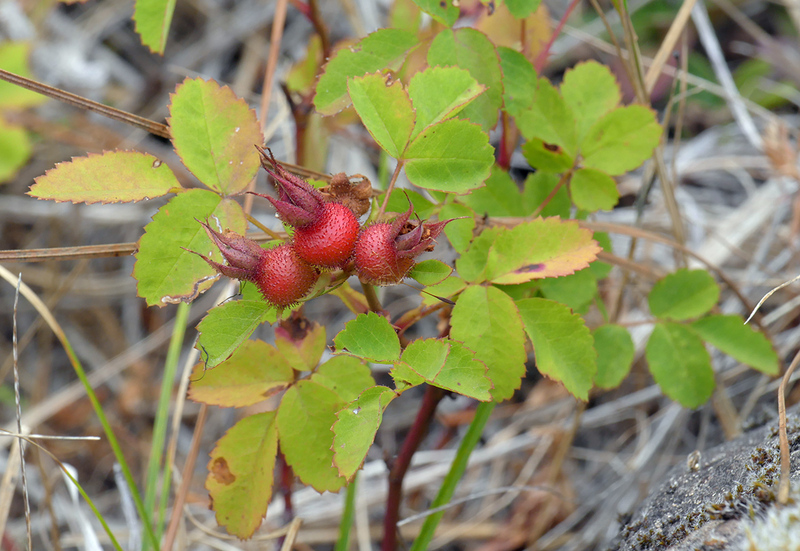 There we hunted around until we found the bright red hips of ground rose (Rosa spithamea) among the grass. They had bloomed well and the hips were perfectly ripe, so we both collected some hips and a few cuttings. I hope I’ll be able to grow this charming little rose. Hall’s lomatium (Lomatium hallii) and spring gold (L. utriculatum) are both perennials that go dormant to survive the summer drought and return with the fall rains. 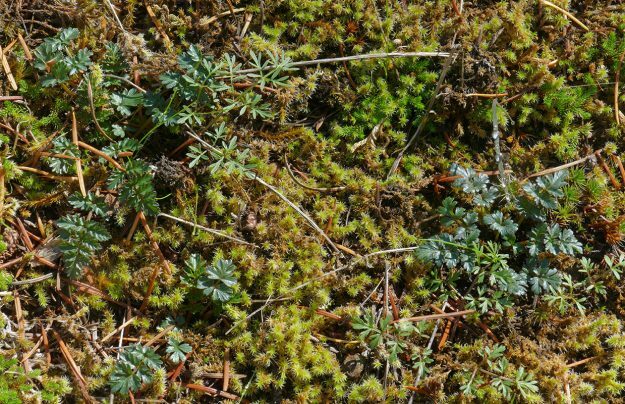 Hall’s lomatium (darker green) prefers rocky habitat while spring gold (lighter green and lacier) likes the deeper soils of meadows. This section of Grassy Glade apparently satisfied both their needs. It was a while before the weather and my schedule allowed me to get down to the Rigdon area again, but a stretch of gorgeous Indian Summer at the end of October made me drop everything and drive out there several times. The first trip was on October 23rd. Molly Juillerat and I went over to check out Grassy Glade and look at some nearby openings neither of us had investigated before. The first one, just east of Grassy Glade, had looked promising on Google Earth, but it turned out to be fairly disturbed habitat with very few natives. Molly hadn’t been to Grassy Glade for many years, so we spent a while wandering around the meadows there for a while. The sunshine and mild temperature were a real treat and brought out a number of butterflies, including coppers, sulphurs, and lots of California tortoiseshells. We also saw a large orange butterfly sailing up into the upper reaches of the conifers on the far side of the meadow when we arrived. Its flight seemed much more relaxed than that of the tortoiseshells. We both hoped it was actually a monarch, but I couldn’t get my binoculars out in time, and it never reappeared, so we’ll never know if we were just wishful thinking. We had a little more time before Molly had to get back to the Middle Fork Ranger Station, so we climbed up to a small, sloping meadow just above the road on the way back, between the Staley Creek Bridge and an old quarry on Road 2136. We didn’t spot any milkweed remains, but there were a few oak trees and lots of evidence of good natives. There were so many puffball mushrooms, we decided to call it “Puffball Prairie”. There’s another meadow farther up the hill and more open habitat above the nearby quarry, so we put this area on our list of places to check on next spring. 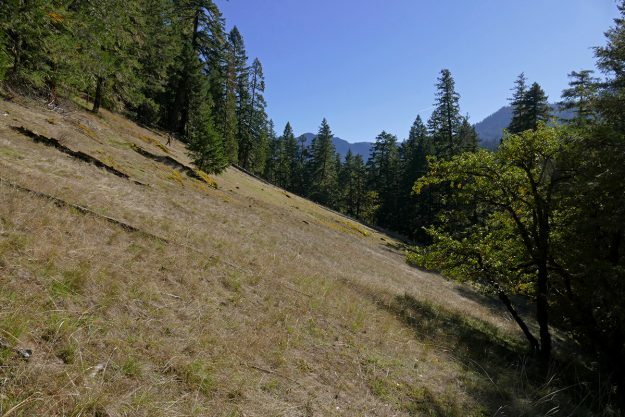 On October 29th, I decided to check out some more open areas south of the Middle Fork of the Willamette River but this time on the west side of Coal Creek. When I left my house, it was quite foggy. The forecast was for clearing, but when I reached Hills Creek Reservoir and was still in the fog, I was quite discouraged. Thankfully, just south of the bridge across the bottom of the reservoir, I suddenly left all the cold and dreary clouds behind. It appeared that it never cleared up in Oakridge, and in fact, I drove right back into it on my way home. I certainly was in the right part of the county! 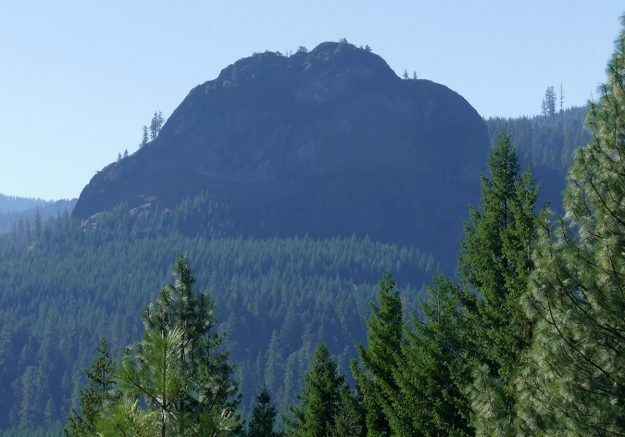 The north side of “Mosaic Rock” can be seen quite well from what I’ve dubbed “Madrone Butte”. I drove up Coal Creek Road 2133 and took the first right onto Road 200 toward Mosaic Rock but only drove a short way past Jim’s Oak Patch to the corner of Road 2125. First I walked up a small road to the north and cut through the woods to an open summit. The view wasn’t quite as expansive as it appeared to be on Google Earth, but it still gave me a good look at the areas to the south and east, including the prominent monolith that Sabine and I call Mosaic Rock. It was mostly covered with madrones (Arbutus menziesii) and manzanitas (Arctostaphylos canescens), but I did spot seedlings of bluefield gilia (Gilia capitata) and other nice annuals that might provide some color in the spring. The madrones at the base of what I’m calling “Lower Shy Creek Meadow” were covered with bright red berries. To the east, Diamond Peak has a little snow. Next, I walked on an old bermed-up road, Road 034, on the other side of the main road. It was nice and level, and in a half mile, the road intersected an open slope. The small upper area was evidently seepy in the spring because I could see a sweep of monkeyflower (Mimulus/Erythranthe sp.) leaves. The lower section was larger and rockier. I followed the gurgling sound of water to the edge of the woods where a small creek divided the opening from the forest. Later I decided to call this darling creek “Shy Creek” and named the meadows after it. I spotted little bluefield ;gilia (Gilia capitata) seedlings popping up and saxifrage leaves. This looked like a promising area. With an aerial photo in hand, I headed into the woods at the bottom of the opening, dodging a number of clumps of poison oak. It only took a few minutes through the open woods until I emerged in a much larger meadow—the main destination of my outing. It had a beautiful view toward the southeast of Diamond Peak and nearby Dome Rock. The meadow was quite rocky but with only a few areas of real outcrop. 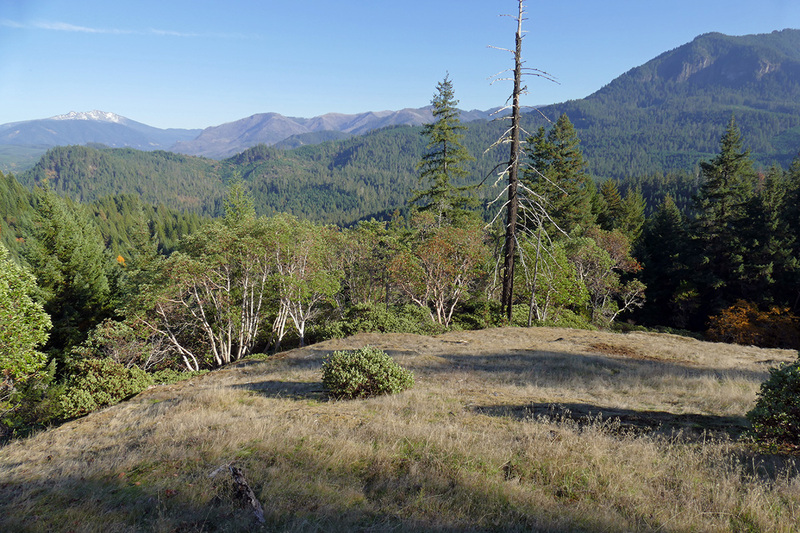 Several madrones (Arbutus menziesii) and Oregon white oaks (Quercus garryana) were growing near the conifer forest at the base. While I didn’t spot any milkweed, I was pleased to see so few invasives. Many nice natives were emerging now that the ground had gotten some moisture. Both California mistmaiden (Romanzoffia californica) and Hall’s lomatium had reappeared after their summer dormancy. Rosy plectritis (Plectritis congesta) is a winter annual, and its seedlings were also evident. The only thing still in flower was the abundant fall knotweed (Polygonum spergulariiforme). This site will be high on my list of places to return in the spring to see what else blooms in this pretty meadow.